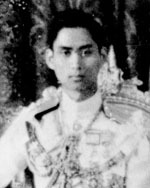 His Majesty King Ananda Mahidol was born on 20 September 1925 in Heidelberg, Germany, elder son and second child of His Royal Highness Prince Mahitala Dhibesra Adulyadej Vikrom, Prince of Songkla, and Her Royal Highness the Princess Mahidol of Songkla, who later became Princess Sri Nagarindra, the Princess Mother. He was the elder brother of King Bhumibol Aduyadej of Thailand. King Anada became King of Siam on 2 March 1934 at the age of 9 after his uncle, King Prajadhipok (Rama VII) abdicated. With Siam in political termoil back then, the Princess Mother, Princess Galyani, King Ananda and the then Prince Bhumibol stayed on in Switzerland for their education. It was also a chance for them to continue a normal family life without the heavy pomp and circumstances they would have witnessed in Siam. The king returned to Thailand in 1945, and died of a bullet wound in 1946, just a few weeks before his scheduled return to Switzerland for further education. He was just 21 years old, and was yet to be crowned. The king's death is still an unsolved mystery. A good and fair account of his biography and death can be found on Wikipedia. When King Rama VII abdicated the throne, the next in line was Prince Mahitala Dhibesra, but as he has died, the crown then passed to his eldest son, who was Prince Anada Mahidol, who thus became King Rama VIII. In fact, the line of succession should have stayed within the line of the Queen Regent Sri Bajarindra, as she was the most important queen of Rama V, being the only Queen Regent. Rama VII's heirs were, in fact, Prince Chula Chakrabongse, son of Prince Chakrabongse, and secondly, Prince Varananda Dhavaj, son of Prince Chudadhuj. It was said that because Prince Chula was half Russian, he was not eligible to be King of Siam. Due to the political turmoil, it was said that everyone overlooked Prince Varananda because he was too old, meaning he could not be controlled by the government. The reason given officially was that the "order of succession has already passed Prince Chudadhuj and his descendants, thus he could not be the next King of Siam." Prince Ananda was only 9 years old, thus the government thought that they could mould him. They also had free reign of the country most of the time, as the king was too young, and needed to stay away from Thailand for education. A Council of Regent that was set up would pose no trouble for the government either. It was just politically correct - a perfect situation for the new government to run the country the way it wanted to. At right, is a video of the young King Rama VIII before his return to Switzerland for further studies. At right, is the video of the Cremation Ceremony of King Rama VIII, part 1. The Cremation Ceremony of King Rama VIII, part 2.